Well, I’ve done my first proper Sunday “ton”on the CEEPO MAMBA.. What a ride .. Windy but warm.. The Welsh roads were wet , dirty , slippery and green going down London Bridge , but the Mamba handled them all with ease .. GREAT , GREAT BIKE .. Went on a loop to start as I’d forgotten to charge my mobile and then… I went over the Marshes and my favourite Boardwalk, up through Northop to the Rhosesmor Climb, down the VERY fast descent to the climb to Lixwm Quarry and then over London Bridge .The CEEPO just breezed up this .. I think the short back end and the fact it’s so rigid laterally and at the BB . Then it was blasting down the valley to Ruthin and up the Nant-y-Garth . A head wind up the back of the Shelf, down to Llanbedr Dyffryn Clwyd and up the Blwch . Then left through Cilcain and the climbs over to Moel-y-Crio and back down one of my favourite descents THE GREEN .. to Connahs Quay and then a nice detour around the Wirral lanes chasing it .. All this for 100 miles and 6,500 Feet of upwards at 16.2 MPH .. Not bad .. … Hard ride I have to say !! 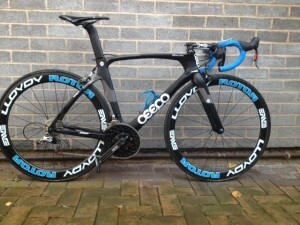 Loved it though and LOVE the CEEPO MAMBA ! !